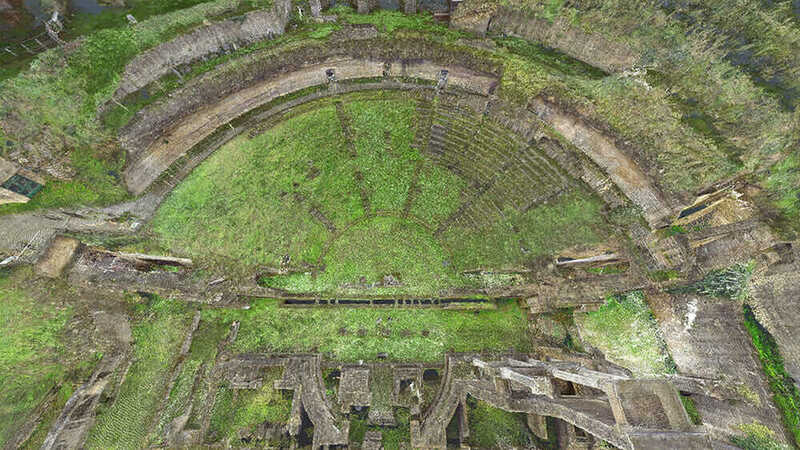 In Volterra, Italy, overlooking the Pignano limestone steps of one of the most well-preserved Roman theaters in the country, Richard Celender watched in awe as a 3D Robotics–made solo drone soared quietly overhead. Before his eyes, history was being remade. Celender is an FAA-licensed remote pilot and vice president of the Pittsburgh-based Civil & Environmental Consultants (CEC). 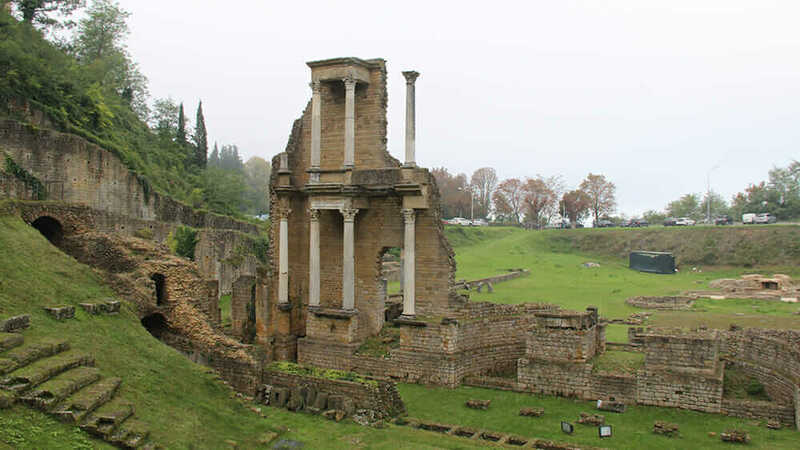 As part of an international reality-capture workshop from October 10–22, CEC—along with Volterra Detroit Foundation, Case Technologies, Autodesk, and 3D Robotics—collaborated on an unprecedented mission: Using drones, cameras, and laser scanners to produce textured, 3D mesh models and animated videos of the ancient Italian city, its archaeological remains, and some of its treasured artwork. 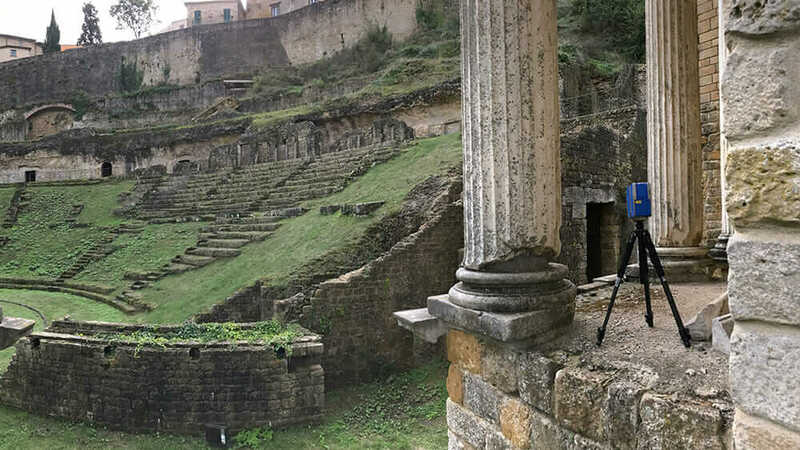 A close-up of the ancient Roman Theatre in Volterra, Italy. Courtesy Rob Sinclair, Civil & Environmental Consultants, and the Volterra-Detroit Foundation. The ancient Roman Theatre in Volterra, Italy. Courtesy Autodesk, Inc. and the Volterra-Detroit Foundation. 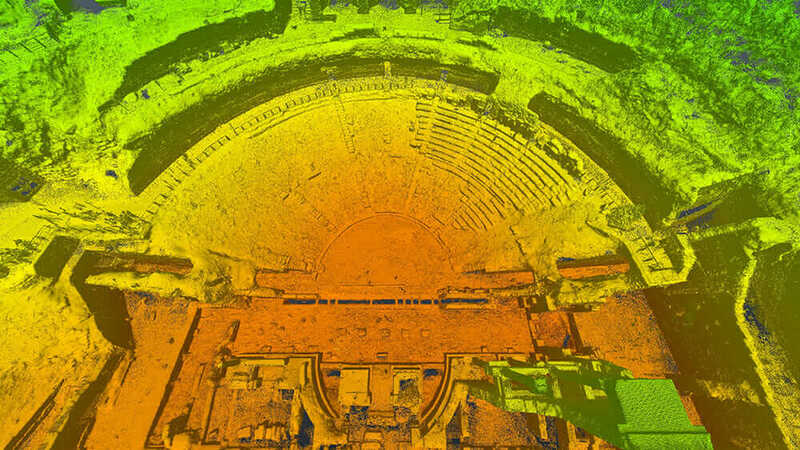 An image showing one of three ways to visualize laser-scanning data captured at the ancient Roman Theatre in Volterra: in color, by elevation, and by light intensity. Courtesy Autodesk/Volterra-Detroit Foundation. “The scans and models captured for this project can help with future restoration efforts or help re-create an archaeological treasure if needed, to see where a column fell, to go back to that exact point in time and say, ‘Here’s where the columns were,’ and put them back in scale, that’s pretty incredible,” Celender says. The reality-capture workshop was rare for its historical significance, but not for its methods. Increasing numbers of construction companies and civil and environmental engineering consultancies are turning to drones to capture rich aerial data and generate detailed—and financially valuable—3D models of earthwork and building sites. Learn how drones can help improve construction projects. According to Celender, the types of projects that can be performed using drones run the gamut, from creating volumetric maps of material stockpiles for large mining companies to inspecting natural-gas processing plants and identifying the boundaries of protected wetlands. Construction safety is another powerful case for using drones, says Hunter Cole, who is part of the Virtual Design and Construction team at general contractor Brasfield & Gorrie. Cole—along with Brasfield & Gorrie colleague Jesse Creech—presented a “Drones in Construction” lecture at the 2016 Autodesk University conference in Las Vegas. 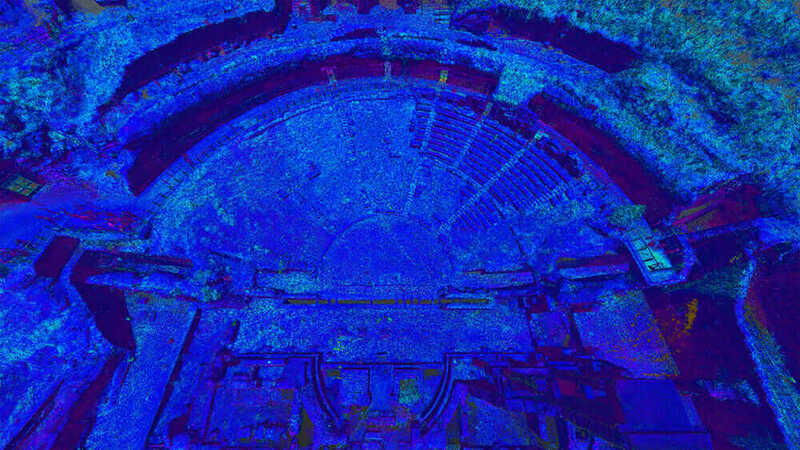 “Reality capture gives teams a new perspective to see every detail of a site in its current state and from a remote location. We can plan workflows and develop safety and site logistics plans that identify high-traffic areas, crane clearances, and areas where material will move in and out,” Cole says. According to a March 2016 report from Goldman Sachs, construction will be the largest use case for commercial drones in the immediate future, generating $11.2 billion of the projected $100 billion in global spending over the next five years. CEC’s client list, which includes Walmart, Chevron, MarkWest Energy Partners, Williams Companies Inc., Waste Management, and various coal and aggregate mining clients, is perhaps a good indicator these projections are on track. 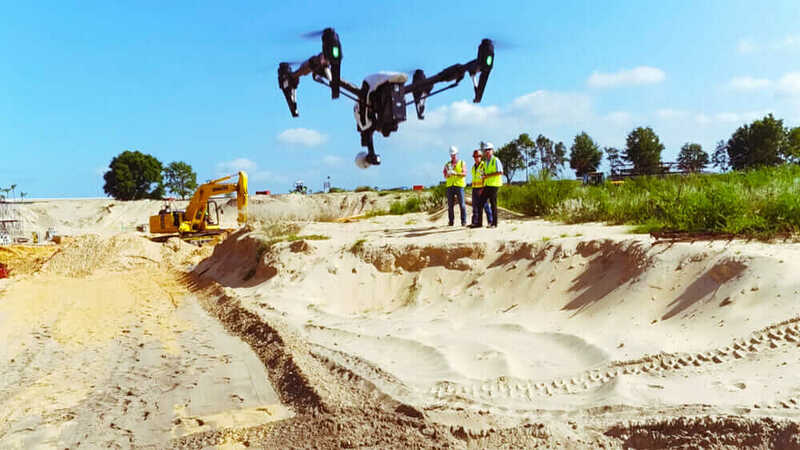 The economic benefit of using drones was apparent in a recent exercise to verify site work for the 61-acre Florida Hospital Apopka project: Cole estimates that surveying a site with a drone helped provide nearly a 75 percent time savings. A drone flying over the Florida Hospital Apopka project site. Courtesy Brasfield & Gorrie. 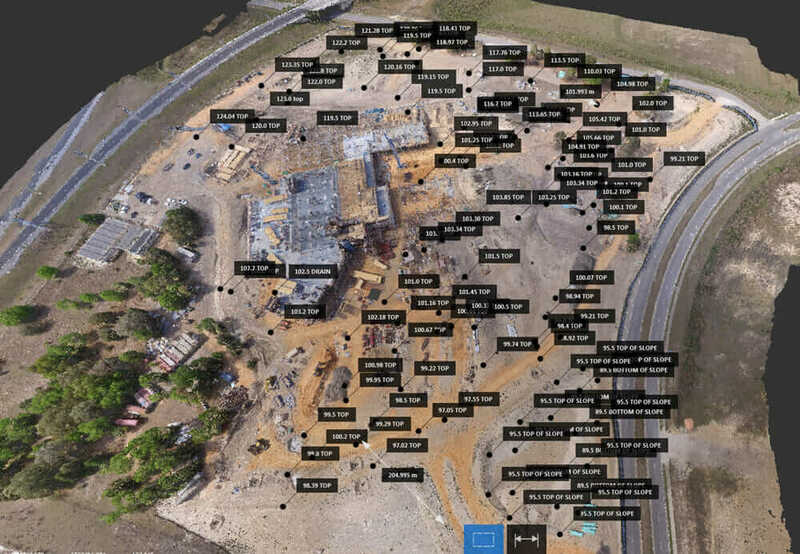 Rather than collecting survey points the traditional way—by shooting points on a predetermined grid—Cole says Brasfield & Gorrie’s Virtual Design and Construction group processed aerial data captured from a DJI drone using DroneDeploy’s mobile cloud platform. Through photogrammetry (measuring distances through a cloud of data points), the team converted this information into an elevation map and 3D model, which illustrated where they were in the process of moving soils to achieve the proposed grade. The future for companies using drones in construction is likely to get even rosier under “Part 107,” the Federal Aviation Administration’s new rules governing the use of drones by commercial operators. Under the regulatory framework enacted in August 2016, a traditional pilot’s license is no longer required to operate a small unmanned aircraft. Instead, passing a knowledge test can grant an applicant a certificate specific to flying a drone. Cole, who possesses a remote pilot certificate, says the two-hour, 60-question test covers how to read airspace sectionals, calculate loads on an aircraft, understand weather theory and drone operations, and learn new Part 107 regulations intended to minimize risks to other aircraft, people, and property. Here’s a small sample from the full summary. Unmanned aircraft must weigh less than 55 lb. (25 kg). 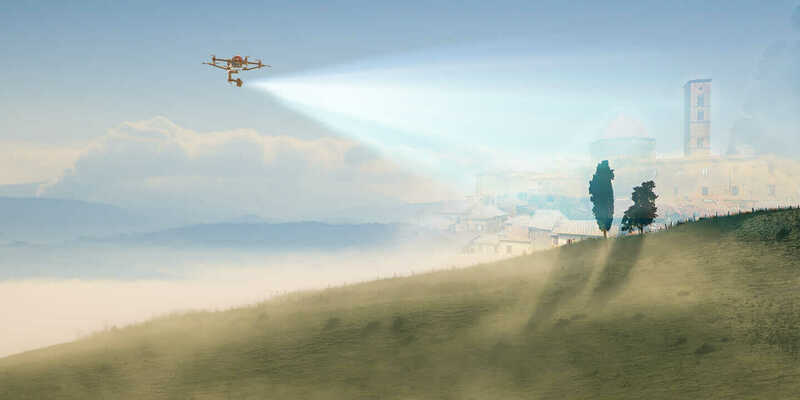 The unmanned aircraft must remain within visual line of sight of the remote pilot in command and the person manipulating the flight controls of the small unmanned aircraft system (UAS). Daylight-only operations, or civil twilight (30 minutes before official sunrise to 30 minutes after official sunset, local time) with appropriate anticollision lighting. Aerial data captured from a DJI drone at the Florida Hospital Apopka project. Courtesy Brasfield & Gorrie. Click here to discover more of the latest construction technology trends from Redshift.